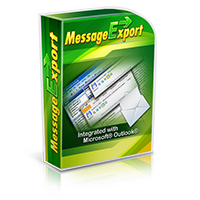 Very few software applications will allow you to export multiple Outlook email messages directly to a single PDF file. MessageExport is a unique add-in for Outlook that performs this task quickly. First, why would anyone want to export multiple emails into one very large PDF file? When working with a quantity of emails, preparing email for a special purpose such as litigation, or archiving emails, a single pdf offers the convenience of transportability and organization when compared to managing multiple smaller PDF files. Organizing emails into a single PDF file makes it easy to share and store messages. Using MessageExport is straightforward. Just select your email messages from the Outlook mail list, choose the "export profile" you want such as "Export to Single PDF," and then click the blue Export button. Encryptomatic LLC, the developers of MessageExport, have made the software very flexible. While it will probably do 95% of what you need right out of the box, you can edit any of its operational settings. For example the export profile called "Singe PDF - attachments saved to disk," can be edited, changed, or you can build your own export profile. This gives you a lot of flexibility to organize your routine tasks. For example, you could choose to build an export profile that runs at a regular interval to export new emails into a single pdf file, then adds it to a password protected zip file, gives it a special name, copies it to a Sharepoint library, and then executes a shell command. While most people will not need to do this, this powerful functionality is built into every copy of MessageExport. Export profiles can also be saved to an xml file, and then imported into another copy of MessageExport. This makes it easy for an administrator or power user to design a complex profile and then share it with other users.